Moose feeding in pond north of Wiseman. Wolf tracks in mud near Wiseman, along with a lone caribou track. Grizzly grazing on ripe blueberries in August just off the road, in the Dietrich River valley north of Wiseman. (Left to Right) Two moose in pond near Dalton, part of the Central Arctic Caribou herd near Dalton (N.Slope), Dall sheep near Atigun Pass, Wolf north of Atigun Pass, herd of Musk Ox on the North Slope. Moose, bears (both black & grizzly), Dall sheep, caribou, musk oxen, wolves, red fox (3 color phases), arctic fox, lynx, wolverine, as well as smaller game such as marmots, arctic ground squirrels, snowshoe hares, weasels, martin, beaver, & muskrats. Polar bears are generally not viewed from the Dalton, as they live along the arctic coast & very seldom does one venture near the Dalton. There is also an enormous variety of migratory birds that travel from around the world each spring to nest in the awesome habitat found in the boreal forest & arctic tundra wetlands. Migratory birds start showing up in the arctic beginning in April, and many remain for most of the summer, and can be seen until late July. A few of the more exotic sightings - (mostly from north of the Continental Divide) - are King & Spectacled Eiders, Blue Throat, Oldsquaw, Yellow Billed Loon, Peregrine Falcon, and the furthest traveler; the Arctic Tern, to name a few. Golden Eagles remain all year, as well as (of course) ptarmigan, snowy owls, boreal owls, chick-a-dees, gray jays, and ravens. 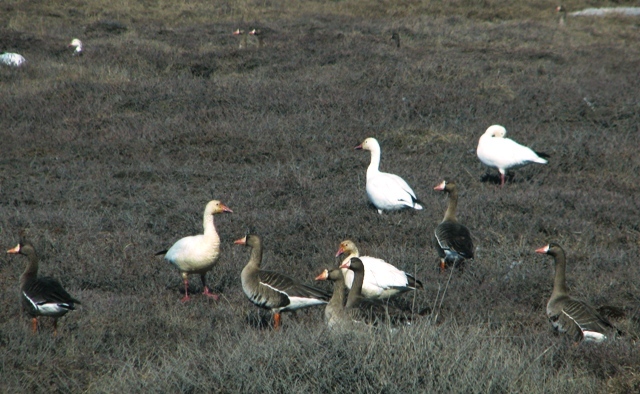 Tundra Swan, flying White Fronted geese with pipeline. Spruce grouse near Wiseman, cow moose in pond near Wiseman (August). 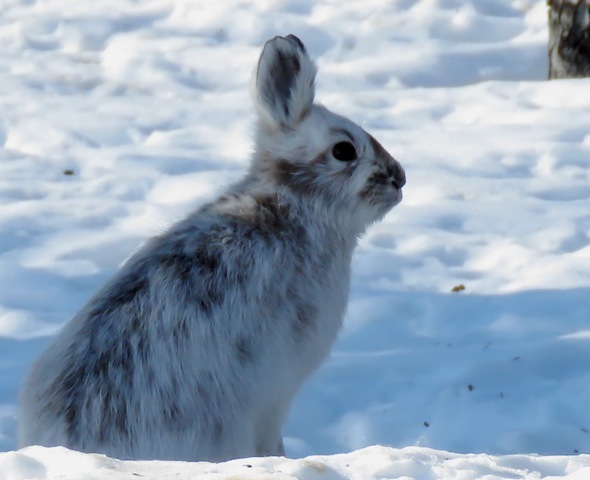 The majority of wildlife sightings are from within the Brooks Range, and north of the Continental Divide, or what's known of as the North Slope. The reason for this is the terrain. You are in hilly, but open forested areas as you leave Fairbanks traveling north; moose are most commonly seen in this type of terrain, possibly black bears, and some of the fur bearing animals such as lynx, fox, and wolves. After you cross the Yukon River the terrain is still forested but more open, and at one point you will cross some high open alpine tundra (Finger Mountain area); here it is possible to see both black & grizzly bears, caribou (this is a very small herd of caribou, seen usually only in spring & fall on their migration through the area), moose, and a variety of furbearers are also possible sightings if you spend some time & keep your eyes open in this area. The terrain becomes forested again after crossing the Arctic Circle, and most wildlife is seen only if close to the road. It is not until you reach Coldfoot, which is entering the Middle Fork of the Koyukuk River Valley and the foothills of the Brooks Mountain Range, that wildlife sightings become more common. The valley acts somewhat as a funnel for game, and sightings are more frequent the further north you travel in the valley. Black bears are more commonly seen in the lower part of the valley, but grizzlies, wolves, moose, caribou (in winter), sheep (on mountains), wolves, fox, lynx, wolverine and other furbearers, Golden Eagles as well as a variety of other birds & raptors are all possibilities. The most wildlife sightings come from the North Slope - once you cross the Continental Divide there are no more trees, only small shrubs & willows. Rolling tundra hills stretch to the wetland of the flat coastal plain, which reaches to the Arctic Ocean. There is not much to block your view if any animals are within sight! Dall Sheep are common to see in Atigun Pass & in the mountains to the north of there, grizzlies, musk oxen, wolves & caribou are all resident on the slope, as well as moose, although not as many. All 3 species of red fox can be seen on the N. Slope, and nearer the coast, arctic fox. Arctic ground squirrels & Marmots are quite common. This is where you will also see the greatest variety of migratory birds, as they travel to this desert wetland to nest from around the world. During the summer the most likely times to view animals are during the very early morning, and late evening hours. Since there is 24 hours of day/sunlight here during most of the summer (generally from May through mid-August) it may be hard for many to tell when it is day or night! - But not animals - Anytime between 8PM through 8AM are generally the best hours to catch critters out & about, and the early morning (midnight through 5AM) is generally the coolest time of the day, when animals are likely to come out to feed & roam. This is also the time when you will find the least amount of traffic on the road, which also effects what you will see. During winter months, when it is mostly dark in the far north, you are more likely to see animal tracks in the snow off the road or crossing. During the short daylight hours you can sometimes view tracks from a distance, and follow them with binoculars to spot game. Wildlife have different habits & territories during different seasons, and the best times of year to see animals it seems are during the change of seasons - May / early June, and August / Sept.
Generally early June (1st week, or even last week of May) is the time of year most of the ungulates are calving. 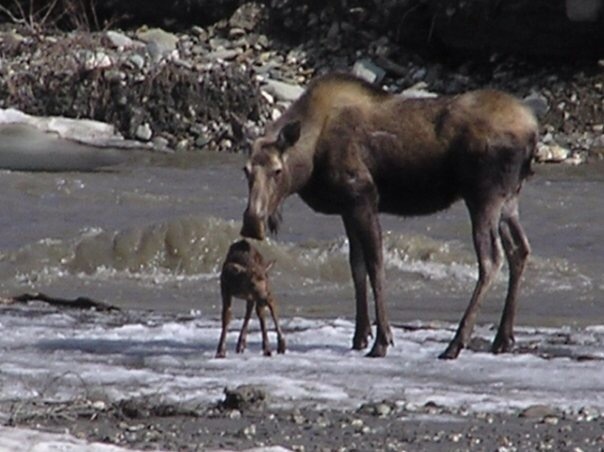 Cow moose are commonly viewed near the road with young calves possibly at any point along the Dalton, or near marshy areas. Dall sheep ewes often come down even onto the Dalton in Atigun Pass with their new lambs in the spring. This is a good area to view sheep (primarily ewes) year round as there are natural mineral licks in the area. 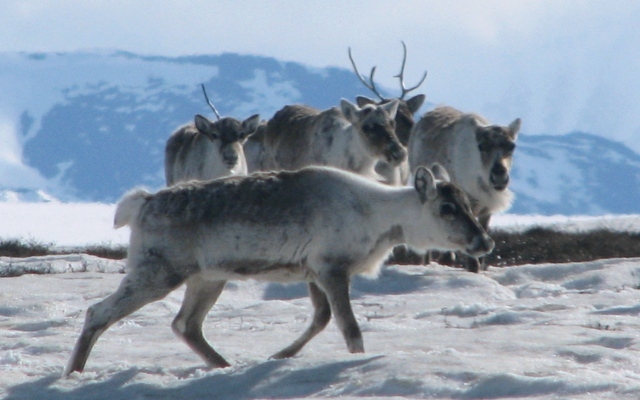 Caribou cows have generally made it to the far northern slope, near the Arctic Ocean, by early June when they have their calves. Musk Ox also calve in the spring, and there is a small herd (approx. 40) generally living near the Dalton north of Slope Mountain (North Slope). Since there are many predators that hunt these young, it is also possible to see more wolves & bears near the highway during the spring. Grizzlies can often be seen near gravel areas digging for roots, near rivers etc, before things really green up. Migratory waterfowl can be seen in almost every puddle along the road as they make their journey north, and thousands of birds can be seen in the wetlands of the Coastal Plain closer to Deadhorse in the early spring. 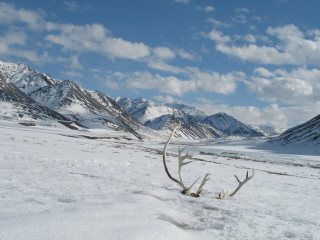 Caribou migrating north in early April, viewed near Atigun Pass. Through the summer it may be a little harder to spot game in forested area as trees leaf out. Cow moose with calves generally frequent marshy areas, where they can eat fresh roots, and other aquatic vegetation, and are commonly seen from the road. Bull moose tend to head for the higher terrain where it's cooler, and are usually not sighted often throughout the summer months. Grizzlies feed on whatever they can find, but tend to stay in higher terrain as well, where they often will spend hours digging up ground squirrels to eat - glass the ridges, and you may spot one. Dall sheep live in the mountains, and are most commonly seen near Atigun Pass, or in the mountains to the north of there; this area has natural mineral licks, and is a good feeding area for sheep. Black bears do not travel much past the central Brooks Range, and are more commonly sighted near the Yukon River, and in the area south of Coldfoot. Small game, and their predators are possible to see the length of the Highway. Blueberries start to ripen usually by mid July, and other berries follow shortly after. Bears feeding on these berries can often be seen in the low slopes of mountains within the Brooks Range, and other areas along the highway. Leaves begin to drop usually the first part of September, making all animals more visible; this is also the time of year bull moose begin their rut, and come off the mountains to search for cows. 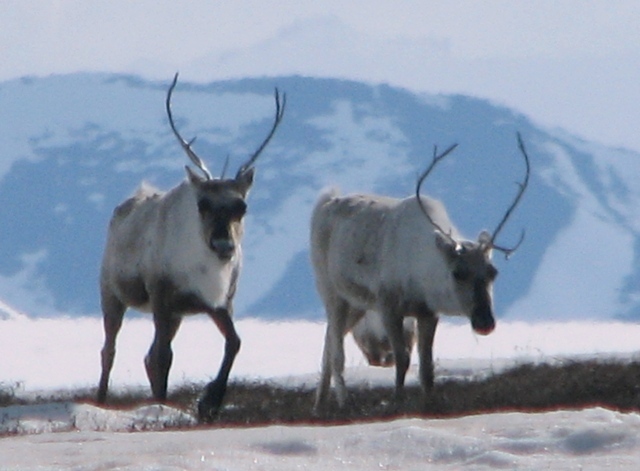 Caribou on the North Slope travel in small bunches, working their way south, and either east or west, starting regular migration to wintering grounds. Late August and September may offer a chance to see several thousand caribou migrating together, which can be very impressive. This is the best time of year for photography in my opinion. Wolves that may have been denning in an area while their pups were young will also now be on the move hunting together, as well as fox, and other furbearers. Migratory birds move south for better weather & habitat. Caribou can be viewed on the North Slope year round, and moose most of the length of the Highway. You have to watch out for moose on the roads in winter, as they sometimes prefer to travel the road rather wade through deep snow off the road! Most common critters to view during winter months are moose, caribou, and a variety of furbearers, such as wolves, fox, and possible a lynx or wolverine. Large flocks of Ptarmigan also can be sighted on the North Slope during winter months. Bears generally den up for the winter in late September, and do not reappear until April or May. Good luck Wildlife watching on your trip up the Dalton Highway! (Left to Right) Cow & calf moose in swamp north of Wiseman, Cross fox north of Wiseman, Pipeline on North Slope, pack of wolves North Slope, Dall ram in snow.